This image, based on observations made with South Africa’s MeerKAT radio telescope, shows the clearest view yet of the central regions of our galaxy. At the launch event, a panorama obtained with the new telescope was unveiled that reveals extraordinary detail in the region surrounding the supermassive black hole at the center of our Milky Way Galaxy. This is one of several very exciting new views of the Universe already observed by the telescope. "We wanted to show the science capabilities of this new instrument", says Fernando Camilo, chief scientist of the South African Radio Astronomy Observatory (SARAO), which built and operates MeerKAT in the semi-arid Karoo region of the Northern Cape. "The center of the galaxy was an obvious target: unique, visually striking and full of unexplained phenomena - but also notoriously hard to image using radio telescopes", according to Camilo. The center of the Milky Way, 25,000 light-years away from Earth and lying behind the constellation Sagittarius (the "Teapot"), is forever enshrouded by intervening clouds of gas and dust, making it invisible from Earth using ordinary telescopes. However, infrared, X-ray, and in particular, radio wavelengths penetrate the obscuring dust and open a window into this distinctive region with its unique 4 million solar mass black hole. "Although it's early days with MeerKAT, and a lot remains to be optimized, we decided to go for it - and were stunned by the results." "This image is remarkable", says Farhad Yusef-Zadeh of Northwestern University in Evanston, Illinois, one of the world's leading experts on the mysterious filamentary structures present near the central black hole but nowhere else in the Milky Way. These long and narrow magnetized filaments were discovered in the 1980s using the Very Large Array (VLA) radio telescope in New Mexico, but their origin has remained a mystery. "The MeerKAT image has such clarity", continues Yusef-Zadeh, "it shows so many features never before seen, including compact sources associated with some of the filaments, that it could provide the key to cracking the code and solve this three-decade riddle". Yusef-Zadeh adds that "MeerKAT now provides an unsurpassed view of this unique region of our galaxy. It's an exceptional achievement, congratulations to our South African colleagues. They've built an instrument that will be the envy of astronomers everywhere and will be in great demand for years to come". 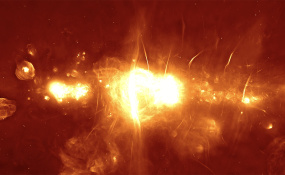 This image (above)*, based on observations made with South Africa's MeerKAT radio telescope, shows the clearest view yet of the central regions of our galaxy. At the distance of the galactic center (located within the white area near image center), this 2 degree by 1 degree panorama corresponds to an area of approximately 1,000 light-years by 500 light-years. The color scheme chosen here to display the signals represents the brightness of the radio waves recorded by the telescope (ranging from red for faint emission to orange to yellow to white for the brightest areas). This image shows a wealth of never before seen features, as well as a clearer view of previously known supernova remnants, star-forming regions, and radio filaments. *High resolution image available from Lorenzo Raynard upon request. MeerKAT's 64 dishes or antennas provide 2,000 unique antenna pairs, far more than any comparable telescope. This design feature contributes critically to making high-fidelity images of the radio sky, including this best view in existence of the center of the Milky Way. It is also advantageous to observe the center of the galaxy from South Africa, where it passes overhead and is visible for almost 12 hours each day, unlike from northern hemisphere locations. MeerKAT is a South African project, a precursor to the larger international Square Kilometre Array (SKA). It is managed by the South African Radio Astronomy Observatory (SARAO), where most of the specialized hardware and associated software was designed and built, in cooperation with industrial partners. MeerKAT consists of 64 antennas (or dishes), each 13.5 meters in diameter, located on baselines (distances between antenna pairs) of up to 8 km. An overview of the MeerKAT radio telescope currently being constructed in the Karoo in the Northern Cape, South Africa. The dishes are of a highly efficient design with up to four cryogenic receiver systems operating in different bands of the radio spectrum. The first installed set of receivers operates between frequencies of 900 MHz and 1670 MHz. The vast amounts of data from the 64 dishes (up to 275 Gbytes per second) are processed in real time by a "correlator", followed by a "science processor", both purpose-built. After further offline analysis, images of the radio sky are generated. Eventually, MeerKAT will be incorporated into Phase 1 of the SKA-MID telescope. For more information, contact Lorenzo Raynard, SARAO Head: Communication and Stakeholder Relations.